Made up of more than 60 professional musicians from all over the world, Florida Lakes Symphony Orchestra is the resident professional orchestra of Lake County, Florida. Over the last thirteen seasons, the FLSO has established a reputation for excellence. Telephone 352-589-1500 for more information. Brilliant international classical concert piano soloist and composer, Guy Saint-Clair was not only a child prodigy (composing at age 3 and soloist with orchestra at age 5) but studied with giants of the piano: Yvonne Loriod, Olivier Messiaen, Frieda Valenzi, Paul Baumgartner, earning Doctorates from France, Germany, and Switzerland. His compositions have been recorded with famous symphonies in Holland, France and England. His recordings with the London Symphony include several world premieres. Guy and his wife, International Portrait Artist, Audrey Sanders, are the founders of the FLORIDA LAKES SYMPHONY ORCHESTRA. Beloved of audiences for his outstanding musicality as well as his gentle charm, Guy’s dynamic and heartwarming Spirit will live on with each note of the music he loved so well. The Executive Director of the Florida Lakes Symphony Orchestra since its beginning, Mrs. 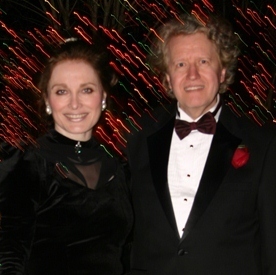 Guy Saint-Clair carries on the vision which she and her late husband began in founding the professional orchestra in 2005. Acclaimed portrait artist, book author, music producer and publisher, former international high-fashion model, Audrey holds a master's degree in education and psychology. She brings an eclectic spice to symphony programming.